Cat caregivers have come to realize more and more that fat cats are not healthy cats. Even the Guinness record book no longer indexes fat cats because of the health dangers to cats by potential contenders. "In my opinion, over-feeding a cat to this extent (despite veterinary advice) constitutes cruelty." Long gone are the days of Henry VIII, when obesity was akin to success, a symbol of "living the good life." Instead of being proud of our Fat Freddies, we should feel chagrin at our role in their unhealthy overweight." Overfeeding is not the whole story behind morbid obesity in cats; the quality of the food is just as important. Some of the most highly-touted commercial cat foods are of poor nutritional quality, and that includes the so-called "weight management" foods. "Felines are the quintessential "Atkins" species, for which high-carbohydrate foods are not simply irrational, they are deadly." Free-feeding dry food: Ideally, a cat should be fed three to four small meals a day, preferably raw or freeze-dried food or good quality canned food. However, many cat owners are dual income, and there is no one home during the day to feed the cats. Hence, they often resort to using "free-fall" dry food feeders, which allow new food to flow into the bowl as cats eat. Fortunately, the pet industry has recognized this problem, and now there are portion-controlled feeders, even timed ones. One good option is the Smartcat Tiger Diner Food Dish. Some models include a one-cup container, which can sit upright on top of the dome: alternatively, food can be poured through a hole in the dome. Below is the wide portion of the food dish, which has holes around the side, through which the cat can stick his paw to draw out bits of kibble to eat. This "controlled grazing" is completely ineffective with a high carbohydrate, high fiber diet. Try to feed your cats with healthier foods. Insufficient exercise: You will find very few obese cats among those who are allowed free access to the outdoors. They get plenty of exercise climbing trees, jumping over fences, and running from dogs. It isn't a good idea to allow cats to run freely outdoors as a solution to weight problems. With climbing towers, scratching posts, and interactive toys, cats can be happily active inside, to help keep their weight in check and to develop and maintain sound, healthy bodies. Also, there are safe outdoor alternatives, such as walking your cat on a leash or building an outdoor cat enclosure. Most cats can be trained to a harness and leash quite easily. Hypothyroidism: Although it is rare, hypothyroid disease can cause cats to become overweight. Fortunately, daily supplements of thyroxine can cause a quick turnaround. Although these serious diseases are not exclusive to overly-fat cats, feline tubbies are more predisposed to develop them. 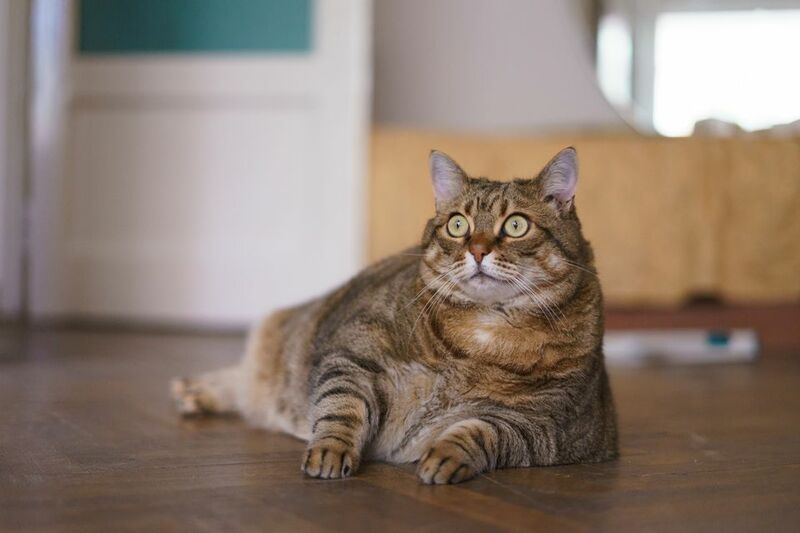 Arthritis: Obesity and arthritis in cats become a double-edged sword. The extra weight on load-bearing joints becomes painful arthritis; because of the pain when walking or jumping, the cat becomes more sedentary, burns fewer calories, and gains more weight unless his eating pattern changes. Arthritis in cats can become a crippling disease, one which our cats simply don't deserve. Diabetes: Feline Diabetes Mellitis is the single most common disease that targets overweight cats and is almost always directly related to diet. Lisa A. Pierson, DVM, of CatInfo.org, wrote about Feline Diabetes: "Feeding a diabetic cat a high carbohydrate diet is analogous to pouring gasoline on a fire and wondering why you can't put the fire out." This rationale also applies to any of the prescription dry diabetes diets such as Purina DM, Hill's Prescription w/d and m/d, and Royal Canin DS. These diets are not only poor quality diets, but they are also still too high in carbohydrates and contain several species-inappropriate, hypoallergenic ingredients such as corn, wheat, and soy. Hepatic lipidosis (fatty liver disease): Fatty liver disease develops when a previously overweight cat loses weight quickly, sometimes the result of untreated feline diabetes, hyperthyroidism, or simply because the cat feels unwell. Although it is potentially fatal, fatty liver disease can be turned around quickly by prompt diagnosis and treatment. Several other conditions could be indirectly linked to morbid obesity in cats. Certainly, excess poundage puts a strain on the heart and circulatory system and could contribute to heart problems. It is never too late to help your Tubby Tom turn into a svelte, active cat. Please give deep consideration to what you have read here, research further, and take the steps you need to help your fat cat live a longer, healthier life. What Are All Those Ingredients in Cat Food?